The University of Southern Maine's Art Department and Galleries will kick off their spring 2018 season of exhibitions and programs with "Cross Pollinating the Grassroots: Works of the Beehive Design Collective" at USM's AREA Gallery on the Portland campus on January 22. For nearly 20 years, the Beehive Design Collective has crafted elaborate, illustrated narrative graphics for use by social movements and communities in struggle. Derived from the ancient tradition of cantastoria, or sung-stories, these graphics are brought to life by dozens of cultural workers around the world. Based on best practices learned over years of collaboration, some longtime "Bees" facilitate hands-on skill-sharing workshops with activists that are open to the public. While at USM, the Collective will develop graphics alongside campaigns for justice in southern Maine. The exhibition will run through March 29. Emily Simons, Pittsburgh-based cultural organizer, illustrator and graphic designer, will give a talk on February 16 on the Gorham campus. Simons cut her teeth on art activism as a member of the Collective. 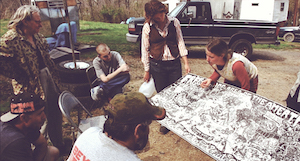 For over a decade, she traveled around the U.S. presenting the Beehive's graphic works to communities in struggle and using arts-based education in social movement contexts. Simons will be Artist-in-Residence at USM from January 22 through March 9, 2018. Her visit is supported by the Warren Memorial Foundation Visiting Artist Series. 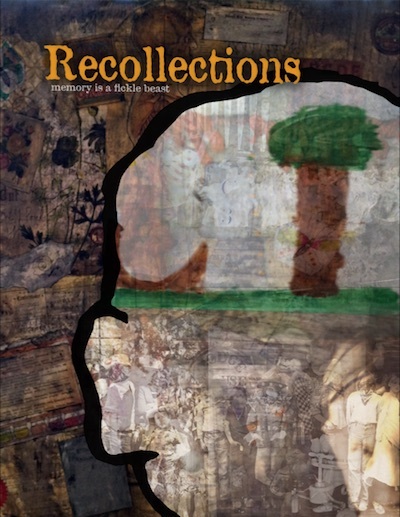 On January 25, "Recollections: Stolen Dreams, Plundered Memories," curated by Maine artist and USM alumnus Danny Evarts in collaboration with USM alumni and the local community, "Recollections" will transform the gallery into an immersive installation that will lead one through the intimate detritus of life in various rooms. The exhibition will run January 25 through February 25 at the USM Art Gallery on the Gorham campus. The spring semester will also showcase the work of USM's students with the annual Student Juried Exhibition, running March 8 through April 1 at the USM Art Gallery (selected works moving to the AREA Gallery April 5 - May 1) -- a show of approximately forty works that three local arts professionals will jury from a number of submissions by USM students. The BA & BFA Exhibition, running April 11-29 at the USM Art Gallery, will celebrate the diverse and engaging thesis exhibits by students in the Art 401 Senior Seminar class. All exhibitions and events hosted by the USM Art Department and Gallery are free and open to the public. To learn more about 2018 exhibitions and programs, visit the USM Art Galleries website.